One of the main cornerstones of CYCLONE is the deployment of all of our developments in a production environment. 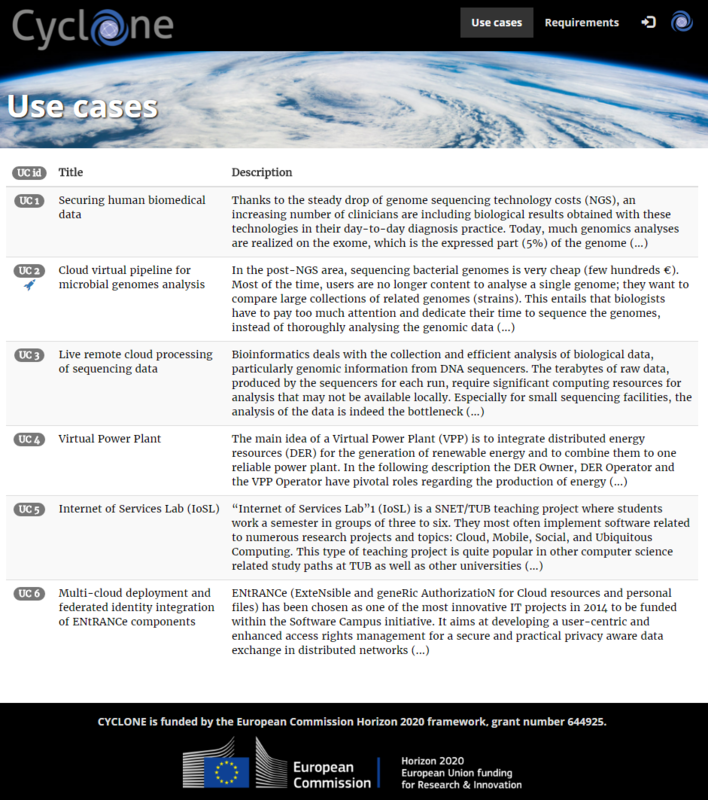 On this page, we present our current CYCLONE use cases. We ease cloud deployment, raise cloud security and offer advanced networking features in the CNRS Bioinformatics research production environment. The management of the multi-cloud environment with CYCLONE components will enable the distribution of computing resources in order to collect measurement data of energy generation and consumption all over the grid. Linking Cyclone to other research projects. On the integration of Cyclone’s Federated Identity Provider to Entrance and an improved Entrance component deployment. We lower the effort of conducting computer science courses while raising the ease of use and the security level of the developed prototypes. You will find use case workflows, user stories, and reqirements.